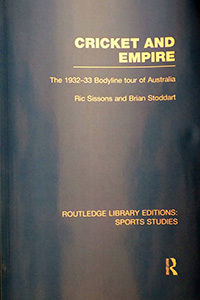 Cricket and Empire was originally published in 1984 at a time when, just over fifty years after one of cricket's most bitter and notorious tours, renewed interest had re-appeared. This re-print is not only welcome but shows how the Bodyline Tour has always been in the public conscience even over eighty years since the event. I would not like to compare Cricket and Empire to others written on the Bodyline Tour of 1932-33 but I do have to say that, placed in context to the happenings in both England and Australia during that period, this is a most interesting book. The imperial part shows that there was respect by the dominions to the "mother country" but, at least on the cricket field, spirit and manner of how the game was played held much store. Hence, in an effort to curb the great Don Bradman's run-scoring, leg-side fields with a round-the-wicket attack by a plethora of fast bowlers were unlikely not to cause offence. Injuries followed and, whilst one former cricketer years later joked to Fred Trueman that black and white film tended to make bowling look slower, there is no doubt that Harold Larwood in the Bodyline series was very quick. Many of those centrally involved in this most notorious of tours are analysed. England's captain, Douglas Jardine, probably comes over in the manner which might be expected: a win-at-all-costs type who can point out that there was nothing illegal from the Laws in his practice and that Bradman's average did, for this series, dip appreciably but was still a pretty fair 56. One of the most famous cricket quotes by Rockley Wilson, "Well, we shall win the Ashes - but we may lose a Dominion" possibly tells the reader much about the England captain. The two Nottinghamshire fast bowlers, Larwood and Bill Voce, come across as loyal players. Perhaps, for me, the most intriguing member of the English set-up was the manager, "Plum" Warner, who appears to have held strong opinions whilst being well-versed in diplomacy. We are maybe fortunate that television and radio coverage had started around this time which helps gives a visual history even if, it seems, the M.C.C. relied on reports. Cricket itself gave much hope to Australian people at that time of uncertainty. The strength of Cricket and Empire is how it portrays the different cultural and political eras of both countries which helps set the tone for the feelings which ran high during the series. The reader will learn much about the infamous cable sent by the Australian Board to the M.C.C., the ruling body of the game for many years and at that time, and how the Australian Board was never likely to win this battle. " We, Marylebone Cricket Club, deplore your cable..." is similar to an errant child being dismissed by its parents. Polite efforts do seem to have been put into the wording by the Australian Board but, up against the heavyweights of the cricketing world and whose background was largely aristocratic, what was a reasonably well-meaning cable ended up causing further embarrassment. The word unsportsmanlike was forcefully asked to be deleted without which the tour was threatened with cancellation. Ultimately, though, who did win off the field? Imperial and trade considerations had to be taken into account and the Australians asked for a reassurance that bodyline/leg theory would not be bowled on their 1934 tour of England. Those publicly and privately supporting Jardine's tactics during the 1932-33 tour soon realised the impact of a possible Australian cancellation of their 1934 tour and so there would be no Jardine or Larwood in the return series. Carefully-worded rule changes were introduced and, when Voce spent one session peppering the Australian batsmen at Trent Bridge with the same tactics, he was effectively retired from the match with sore shins given as the reason. He did not appear in the Tests. This is a fascinating book seen not so much through the cricketing events but through the ways in which both countries operated. The reader will better understand the effects of the British Empire and, for anyone interested in the Bodyline Tour, the angle taken by this book makes it an invaluable addition to the many books written on the subject.